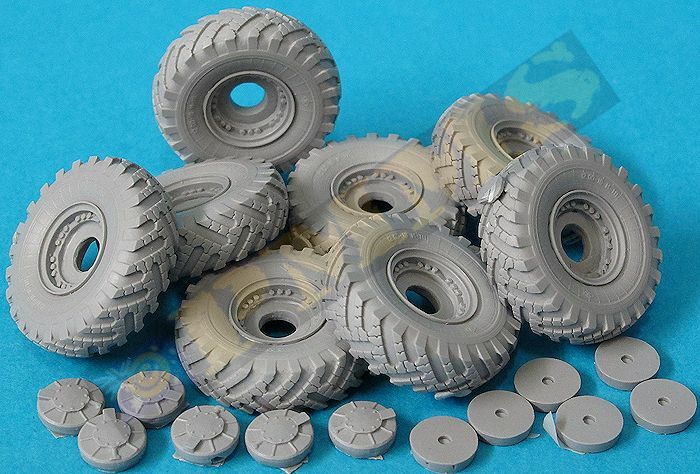 miniarm has released this set of resin replacement wheels for the Trumpeter Russian BTR-60P APC (Kit #01542) which consist of the eight wheels, eight separate wheel hubs and eight separate rear mounting drums in light grey resin. 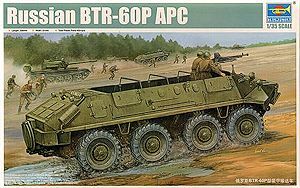 You should note these wheels are different from those used on the BTR-60PB Trumpeter kit #01544 so be careful to use on the appropriate kit. The quality of the resin casting is excellent with just a small casting plug on each wheel and small casting residue on the backs of the hubs and drums, this will need a little care in removing to ensure the backs of the hubs and drums are level. 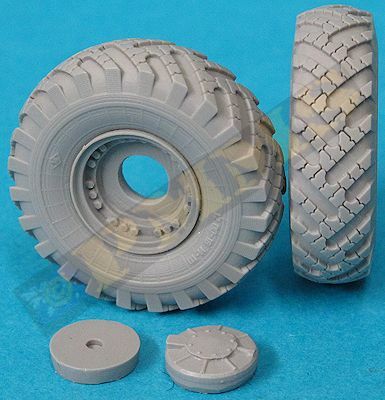 The tyres are cast perfectly round and the small casting scar can be positioned at ground contact leaving the excellent tread pattern unhindered. 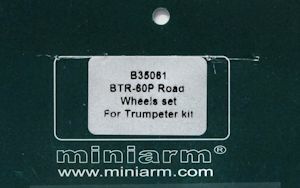 The wheel rims have excellent bolt head details on both sides and the separate hubs and drums allows you to glue these on opposite sides of the wheels to get the correct orientation of the tread pattern for the left and right side wheels, the wheel hubs also have well done details but don't have the fine tyre inflation piping. The tyre sidewalls have excellent details with fine ribbing around the inside walls and additional tyre data embossing for an greatly enhanced appearance over the plain kit wheels. Fitting the wheels to the kit will require a little work as the rear drums only have a small pilot hole and you will need to drill a larger 3mm hole to a depth of 5mm for the kit axle stub, take special care not to drill any deeper so you don't come though the outside wheel hub by accident. Images of the wheels with separate hubs and drums and the left and right handed wheels allowing the correct tread direction either side. Rear view of the wheel needing a 3mm hole drilled 5mm deep for the kit axle stubs. 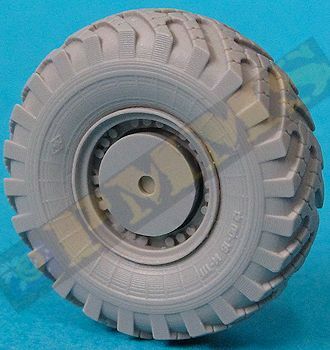 This is an excellent set of replacement resin wheels from miniarm for the Trumpeter BTR-60P APC (Kit #01542) with good clean details, most notably the additional fine ribbing on the sidewalls and additional embossed data. The separate hubs and drums allows you to have the tread pattern orientated correctly on both left and right sides and the rims have the bolt head detail on both sides for additional detail. 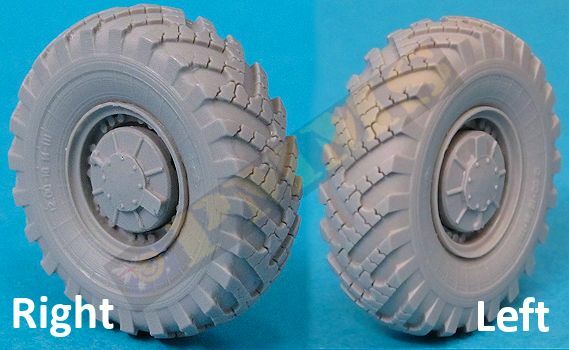 There is some minor drilling to fit the wheels but for those who prefer resin wheels over the kit vinyl wheels this set offers an excellent increase in detail to add to the final appearance of the kit.